Be sure to have a working OpenCart installation before you attempt to install the theme. The changed files are fully compatible with other themes and extensions. You are safe to keep them even if you stop using our theme. 2.1 Replace index.php with a premodified one – browse the Additional directory from the theme package and navigate to the subfolder that corresponds to your OpenCart version. 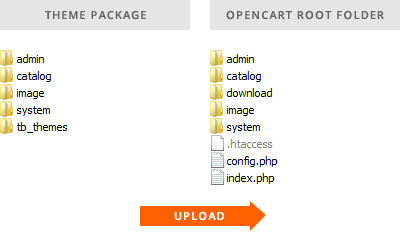 Upload index.php to the folder you have installed OpenCart in, replacing the current one. 2.2 Edit the file manually. The manual editing is recommended if you use vQmod or if you have modified index.php by yourself.